Yesterday I told you about the Sacramento Bee cartoonist who mocked citizens at town hall meetings by portraying them as clowns. Turns out another McClatchy cartoonist -- Joel Pett at the Lexington Herald-Leader -- thinks citizens at the town halls are stupid. Lovely. McClatchy is siding with the Democrats and SEIU against the taxpayers. And if you dare to speak out against the Obama administration, be prepared to become a McClatchy target. 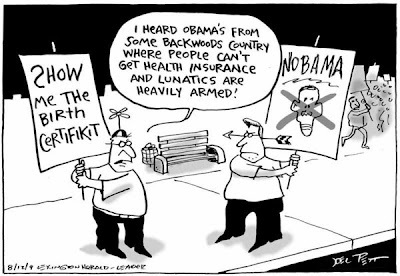 To see the full series of McClatchy Tea Party cartoons, click here and keep scrolling. If anybody is ignorant it's SEIU members. Most of these goons are still studying for their GEDs or in English-speaking classes to learn how to say, "Can I have another entitlement, por favor?" 11:00 AM: That is freakin hilarious and so true. 11:00 and 11:03 have demonstrated that the cartoon was right. Of course, they'll never realize it. Please tell me (better yet, show me) an example of how the protesters have behaved in a manor that shows they are smart. Has it been the yelling? How about the disruption? Can they break out the old lady who McCain had to shut down last year because she was a racist? If you don't want to be portrayed as stupid then stop being stupid. Hey, maybe I should send that to Sarah Palin!!!! SEIUers are uneducated louts who were organized by the Democrats to serve as their Gestapo arm. They'd be mowing your lawn or washing bed pans if this phony union hadn't been cooked up by liberals. At least the townhall protestors are legal citizens. SEIU is a haven for Mexican illegals with phony IDs. So then, where are all the cartoons, let alone the media, about all the DNC shill Plants? All I can say is that these are Political cartoonists. You really only have 2 sides, but when you make a cartoon you portray your belief. Should papers have 2 on staff, and choose the lesser of the 2 evils each day? I know, lets kill all libtards and supplant them with right wing nut jobs so you can get the cartoons YOU want. I think McClatchy, others in the biased media, and their fellow DNC travelers may have actually helped us. Democrats held a four-point lead on the issue last month and a 10-point lead in June. For most of the past two years, more than 50% of voters said they trusted Democrats on health care. The latest results mark the lowest level of support measured for the party on the now-contentious issue. Public support for the health care reform plan proposed by President Obama and congressional Democrats has fallen to a new low with just 42% of U.S. voters now in favor of it. That’s down five points from two weeks ago and down eight points from six weeks ago. I agree, let them be. These moonbats have done more for the Republican party than any of their senators and congressmen. The more cartoons that demean the average middle class American, the more editorials and the more completely insane lies their fellow travelers tell, the deeper they dig. Nothing makes a moonbat more irrelevant than letting them speak. It's 99.9% of all the democrats that make the rest of the democrats look bad! I'd rather be a right wing nut job than a nutless left winger with no job. 11:06...in what way does thinking that goons are goons mean you are stupid? On the other hand, let's examine the proposition that goons are not goons and see if that makes us more of a mental giant....especially since it seems to be your position. Does your comment mean that you think its ok for supporters to "astroturf" a congressman's "town hall" meeting to block out dissent? Do you think its ok to beat up people who disagree with Obamacare? How about the N word...is it ok as long as you are an opponent of the liberal agenda of the moment? How do you feel about ridicule for taxpayers? Is that a good and wise strategy? I think you might need to think through your comment for at least a nano second if you don't want to show the world a room temperature IQ. Does 11:13 really want to make the case that protesters must follow the rules prescribed by those in power? If so, it would be a breathtaking reduction in civil liberties for Americans, several orders of magnitude worse than anything contemplated by the Bush administration. Is 11:13 willfully stupid or does he not understand that protest occurs because of anger, because of disenfranchisement and because their voice have been silenced? When did the liberal voice in America become the voice that would stifle dissent and protest? Must protesters now demonstrate that they are listening to those who would steal from them and oppress them. Must they play nice with elected representatives who refuse to be accountable to the taxpayer? Of course political cartoonists have a point of view. At McClatchy papers they all have the same point of view. That point of view ridicules and demans middle class taxpayers as stupid clowns. You would think there might be a little diversity of opinion. But we all know there's not. especially when the stakes are high. Then it's anything for Obama. If behaving in a way that shows they are smart is a prerequiste for participation in Democracy might Pelosi and Reid please resign right now. Their actions clearly show them to be the dumbest politicians in the history of the world. With a 60 vote supermajority, they are looking at an unprecendented parliamentary trick to try to ram health care through congress. Perhaps we should have an IQ test in order to vote. Wanna bet how that would come out for the democrats. The people speaking out now, would not have known they needed to descent. They only heard news from the left. The bloggers have changed all that now. The Democrats don’t know how to respond to honest criticism, they always had that stopped from the get-go. Obama isn’t even a good speaker without his Soros props. AARP is calling him a liar in reality, that must pinch their lying lips. The sleeping giant is now awake, yes it is! that is fishy sounding, and might be flagged by the government software program that isolates threats. It should be deleted as commentary not acceptable to this blog. Some of these threats are planted to make this blog look hostile. Why take the chance? If Hillary makes a move to run against Obama, how many times to you think we will see these videos? I personally think she sounds unbalanced. Let’s see who ran against Obama, John (the coxswain) Edwards, and Hillary, (the channeler) Clinton. Who won? Barry (the Chicago thug) Soetoro, and these liberals want everyone to think he is the messiah? None of these people should be in any elected position, nor would they be, if the media were not totally corrupted. For now, we are stuck with a Marxist-in-Chief, it will not stand for two terms. This should be the cartoon of the day. These protesters are led around by the nose by right-wing wackos and go where they're told and say what they're told to say, and they don't even realize how they're being raped by the insurance and drug companies. Sounds like the definition of a bunch of clowns to me. People that want their voices heard, should cut these demeaning cartoons out of the paper, and send them to the remaining advertisers with notes of distaste at their sponsorship for people that hate anyone who wants to speak their mind. They can pick up copies of the paper at their local recycling center, still in the wrappers in some cases. Another attempt by a liberal speech Nazi to de-legitmitize those opinions that contradict the liberal line. Dissent to the liberal must be ridiculed and suppressed by all means necessary. But those hand picked, carefully screened Obamacare supporters who dutifully applaud and raise their pre-printed signs right on cue like prozac drugged car puppies....those are the real Americans. Even if Soros is paying them $10.00 an hour. Americans don't want the government to take over thier healthcare with a an all powerful, single payer system. They don't trust Obama and the liberals. They fear the tryanny of government bureaucracy even more than they hate the insurance companies. When the people started to ask why the rush, why we had to go so fast to make such sweeping changes, they were told they were stupid, to sit down and be quiet. Now you have a revolt on your hands as everyday taxpayers are angry, pissed off and feeling like the leadership they just voted into office has betrayed them. This anger is well beyond just healthcare because of the rude and disrespectful way they have been treated. Seeing union thugs loosed on tax payers is sobering. If you think the healthcare debate was bruising, just wait for Cap and Trade. Shhh, don’t tell the papers still allowing their cartoonists to demean people, that it might hurt their bottom-line. Where the hell is their bottom-line anyway? Anon. 2:02 PM, Have you not read about the Obama plants, and phony townhall meetings? Why do you come here with your uninformed opinions? You know few people here will agree with you. It is not because you want to put forth an opposing opinion, if you read the news items referenced here, you know you are full of Obama’s freeze-dried air. The thing you do best, is reinforce the opinion that liberals are anti-people, anti-American, and anti-freedom. Like the demeaning cartoons, you are accomplishing just the opposite of what you think you are. Are all opinions not welcome here? This should be the cartoon of the day. These protesters are led around by the nose by right-wing wackos and go where they're told and say what they're told to say, and they don't even realize how they're being raped by the insurance and drug companies. Uh, that would be the Insurance and drug companies that are contributing 150 million dollars to insuring that Obama's bill is passed? Can you say, bend and spread lil leftie? Go bend and spread yourself, l'il rightie, since you seem to enjoy that.